Kavkazskaya Ovcharka : Earliest Domesticated Dog ? Mikhail Sablin, a scientist at the Zoological Institute of the Russian Academy of Sciences in St. Petersburg, along with his colleague Gennady Khlopachev, analyzed the dog remains, which were found at the Eliseevichi I site in the Bryansk region of Russia's central plain, according to an Informnauka press agency release. "We suggest that the dogs looked like present-day Tibetan mastiffs or Caucasian sheep dogs," Sablin told Discovery News. "The dogs had a much wider palate and shorter rostrum than Siberian huskies and Great Danes. The reconstructed withers height is about 70 cm (27.56 inches), therefore the dogs belonged to a very strange and dangerous heavy hunting/guarding breed." This is a side view of one of the Stone Age domesticated dogs. The researchers point out the dog's relatively short snout, which distinguished them from their wild wolf ancestors. 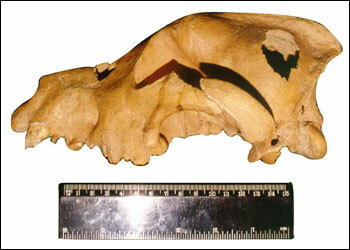 Susan Crockford, an archaeozoologist at Pacific Identifications, Inc., a firm that specializes in identification of birds and animals from archaeological remains, agreed that the Russian dogs "are certainly the oldest complete skulls from this early period," and said, "…the evidence is good that these are truly domestic dogs." She added that other, slightly later, dog remains have been found in Israel, Germany and the Czech Republic but, "I think (the Eliseevichi dogs) remind us that there must be many more than one center of domestication, and not just the Middle East as was once thought." ZHANKRIST x LEYLA Puppies ! A litter of gems born to ZHANKRIST Talgo x LEYLA Hunza ! Mom and pups are doing fine. Look for photos soon in the gallery. Baby BARHAN Arrives at Esquire ! Just as the year 2004 drew to a close, we imported the fabulous male puppy BARHAN Medvezhyi Ugol ! BARHAN is a descendant of the very famous and rare BOSMAN bloodline from Russia. After watching the baby BARHAN video, check out the other new Esquire videos, too ! Still working on site. The Program and Health portions are done, and Awards and Temperament are next! Thank you for viewing. Please stop back again soon. Breed information, articles, planned litter announcements coming soon! Straight News coming straight at you !